Infused with craft beers, these small-batch preserves draw their inspiration straight from the tap. 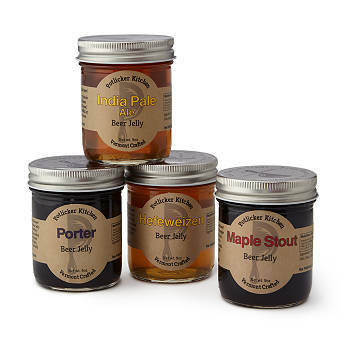 The indulgence of craft beer meets handmade, small batch preserves in this set of beer jellies. When Walter and Nancy Warner moved to Vermont they were inspired by the bountiful local food and beer culture and decided to transform a variety of beers from notable local craft breweries into enticingly unique jellies. The traditional ingredients of beer (hops, malt and yeast) are rendered into jellies that balance malty sweetness with the hop profiles of the beer styles used. Add a distinctive touch to cheese platters, use them for glazing foods, mix them in cocktails and salad dressings, use them for irresistible baking (like peanut butter and porter muffins), or indulge in a grown-up pb&j! Handmade in Waterbury Center, VT. When asked about the inspiration for her unique preserves, bonafide foodie Nancy Warner replied, “I ran out of fruit, but I never run out of beer.” One winter when fresh fruit was out of stock, she began turning unconventional things like coffee, wine, and beer into jelly. You might call Nancy and her husband Walter a renaissance couple. They left their careers in archaeology to relocate to Vermont so Walter could attend the Vermont Law School. While Walter studied cultural resource law, Nancy began to focus on the local bounty, where she found great inspiration in the local food and beer culture. Her first batch of strawberry chipotle jam was made with ten pounds of berries harvested at the Thetford Strawberry Festival. Hooked on canning, Nancy soon had a cupboard of jam, so Walter pushed her to the farmers market. We're going to try them on wings. I gave the beer jelly to my brother in law for Christmas. He was surprised by the unique gift and excited to try it. He said it was delicious and enjoyed it very much. I'll definitely be back for more! Bought this as a Christmas gift for my son and his wife. They are craft beer lovers and love trying new things. So this was perfect gift for them. They were very excited to try all of them. I can't actually review the flavors of the jelly since it was a gift, but it was the perfect gift for a craft beer drinker. This is a Christmas gift, so I don't have a review of the actual product yet, but this was such a fun idea for my dad who is hard to shop for. It was nice to find something a little more exciting than a belt or a tie. I found this somehow on the internet. My son loves beer. Sent to him, he really likes it.